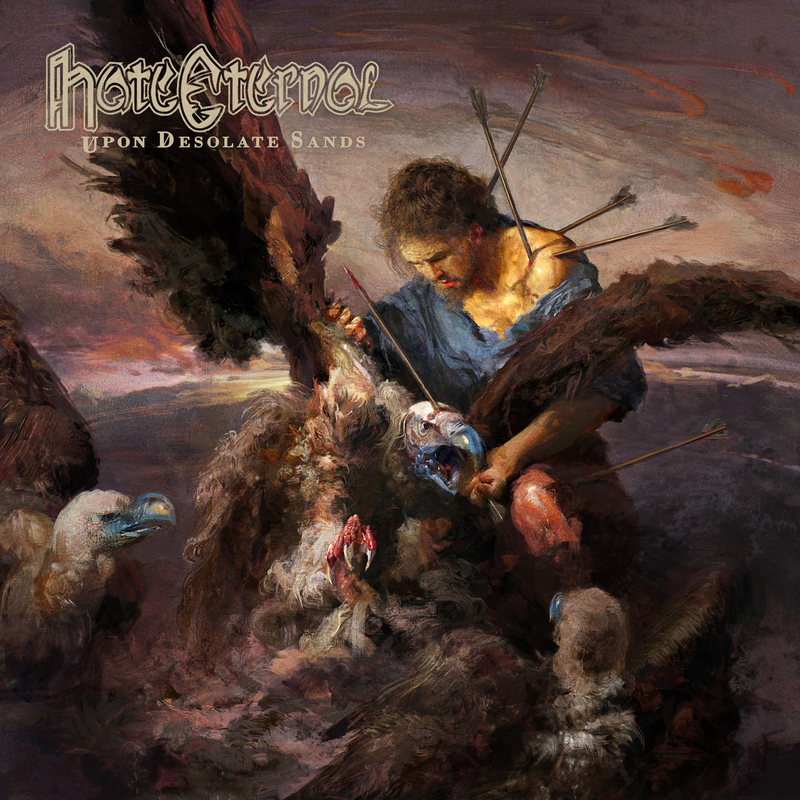 Hate Eternal has a drummer problem. It’s not that ex-Necrophagist skins pounder Hannes Grossman has lost his touch or his ability to carve out creative beats. It’s that he’s just too much. Too much for guitarists that like to put space between the riffs. And, certainly too much for one of the greatest extreme metal guitarists of all time, Erik Rutan. That you must strain to hear Rutan’s chops over most of Hate Eternal’s seventh album, “Upon Desolate Sands,” proves that someone dropped the ball. Whether it’s the technical team for not placing Grossman’s beats in proper perspective, or the band’s management for not telling Grossman to chill out on the overplaying, someone really screwed this up and kept the record from becoming a classic. Even with that tremendous flaw, Rutan is so gifted that he still manages to rescue the material from the trash pile. There are several moments in “Upon Desolate Sands” where emotions unexpected for a death metal outfit come flooding across the speakers. Rutan has an exquisite knack for evoking sadness from his axe. The outros in “Vengeance Striketh” and “Nothingness of Being” remind me of the violin work composed by John Williams in the 1993 Holocaust movie, “Schindler’s List.” Even the instrumental that serves as the album’s closer, “For Whom We Have Lost,” is a brooding work of art. That’s not to say this is a soft record. “All Hope Destroyed” is an absolute crusher. That Grossman (mostly) subdues his sticks is a testament to what the band could be if only he decided to go with the man instead of seemingly churning out a solo album. If he did, Hate Eternal would never drop off my playlist.